Who has a permit to carry a gun in public? And what are they thinking? The MPR News | APM Research Lab 2017 Ground Level Survey of Minnesotans suggests that a similar proportion of Minnesotans at all ages and levels of education have a permit to carry handguns in public. White Minnesotans and Minnesotans of color were equally likely to legally carry handguns. The tragic shooting at Florida’s Marjory Stoneman Douglas High School has once again put gun policy on center stage in our national dialogue. Among the many and varied responses is a call to put more guns in the hands of trained school personnel, who might defend otherwise vulnerable students and school staff. But relatively little is known about the demographic characteristics of those who legally carry handguns in public. Even less is known about how their opinions might vary from (or be similar to) those who do not. A recent report from the Minnesota Department of Public Safety, along with data from our recent Ground Level Survey with Minnesota Public Radio News shed some light on both. Who has a permit to carry? The Minnesota Department of Public Safety reports that in 2017 there were 275,613 active permits to carry a handgun in public (not to be confused with permits to purchase handguns or assault weapons; Minnesota does not require permits to purchase hunting rifles). That works out to about 69 permits for every 1,000 Minnesotans of legal age, 21 or older. Geographically, the rates vary from highs of 115 or more permits per 1,000 in relatively small and rural Cass, Jackson, and Morrison counties, to lows in the state’s two most populous counties of 41 in Ramsey and 38 in Hennepin. Overall, however, the rural-urban split is not as dramatic as those extremes would suggest. For example, there are 57 permits for every 1,000 adults age 21 or older in the state’s urban 7-county Twin Cities region, compared with 72 per 1,000 in the 80 counties collectively referred to as Greater Minnesota. Source: 2017 Permit to Carry Report by the Minnesota Department of Public Safety. Rate calculations and visualization by APM Research Lab. While technically Minnesota’s permit to carry law allows does not require permit holders to conceal their weapons, we included the following question in our Ground Level Survey with MPR News: “Do you have a permit to carry a concealed weapon?” Eleven percent of the scientifically representative 1,654-person sample of Minnesotans age 18 or older indicated that they did. Even considering the 2.4 percentage point margin of error associated with this data point, our survey results are a bit higher than the state’s permit data would suggest. Perhaps a number of our respondents held permits from one of the 15 other states with which Minnesota has weapons permit reciprocity. Or perhaps those with lapsed permits, or others who intend to get a permit in the near future reported that they currently have one. Regardless, it is probably safe to assume that any “aspirational” permit holders included among the 11 percent are similar to actual permit holders. In terms of demographic characteristics, the Ground Level Survey suggests that a similar proportion of Minnesotans at all ages and levels of education have a permit to carry. White Minnesotans and Minnesotans of color were equally likely to report having a permit to carry. However, gender and income differences exist: Men were more likely to report having a permit than were women (17% compared to 6%). Permit ownership was significantly more common among those with higher incomes; 20 percent of those with annual household incomes of $100,000 or more report having a permit, compared to less than 7 percent of those with incomes below $50,000. How do the opinions of Minnesota’s permit holders differ from non-permit holders? Those who report having a permit to carry are more politically conservative than are those without a permit: 69 percent of those with a permit identify or lean Republican, compared to 36 percent of non-permit holders. At the time of the survey 58 percent of permit holders approved of how Trump was performing as president, while only 33 percent approved of Governor Dayton’s job performance; those who do not have a permit had exactly the reverse approval ratings for these two leaders. Perhaps harder to guess, how do those with permits to carry weapons feel about a variety of social and economic issues? We looked at 18 issues, including seven asking respondents about their level of trust in various institutions, and another nine asking respondents whether they feel the state is on the right or wrong track on a variety of issues. On two-thirds of these questions the differences between permit holders and others were not statistically significant. Permit holders and others are equally likely to trust the state’s medical system, public schools, and big business. Both groups are similarly inclined to say that the state is on the right track (or wrong track) regarding water protection, educating children, strengthening the economy, caring for older adults, health and mental health care, and providing equal economic opportunities. Are people carrying weapons because they do not trust the police? Not according to the results of this survey, as even more permit holders indicated they trust the police to do what is right either most of the time or just about always than is the case for those without a permit (85% compared to 75%). Are those carrying guns more religious than others? It is hard to say if permit-holders are more religious, but a higher proportion express trust in organized religion than is the case among those not holding permits (73% compared to 61%). According to results of a different survey question, the two groups attend religious services at similar rates. Taxes? Only a minority of gun permit-holding Minnesotans think they are getting a good value for the taxes they pay, compared with a majority of those not holding a permit. Do permit holders trust the news media? Not many of them do; only one quarter indicated trusting the news media to do what is right at least most of the time, compared with nearly half of non-permit holders. Hopeful or fearful about the future? 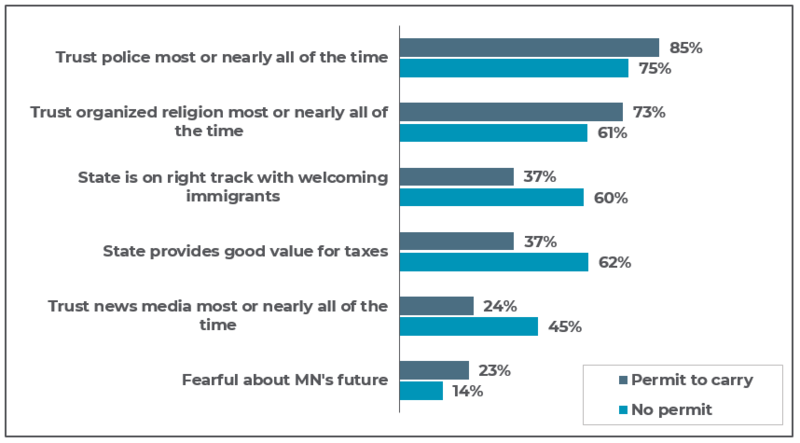 Like others, most permit holders are hopeful about Minnesota’s future; however, a higher proportion indicated they are fearful (23% compared with 14%). This summary of the data has little to say about whether and how permit to carry policy, much less other gun-related policy, should be changed in Minnesota or elsewhere. We did not, for example, ask permit to carry holders or others what they thought of current policies and practices. It does, however, provide some insight to the characteristics and thinking of those among us who lawfully carry firearms as a measure of personal protection. Reactions? Please email us your thoughts or respond on Twitter or Facebook. Related: Permits to carry pistols rise at slower rate (March 7, 2018; Minnesota Public Radio News). © 2019 Minnesota Public Radio.All rights reserved.